Please note that our pool will be closed on Sunday- May 1- for a private event. We apologize for any inconvenience this may cause. 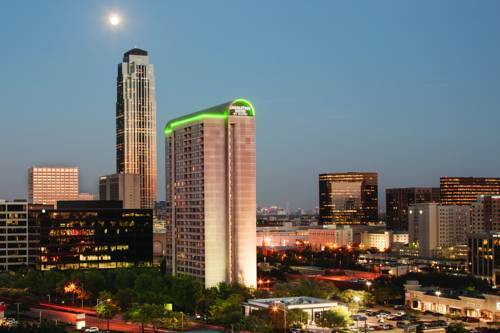 Welcome to DoubleTree by Hilton Hotel - Suites Houston by the Galleria just 30-45 minutes from Hobby Airport and George Bush Intercontinental Airport. Relax in our family-friendly Houston hotel offering outstanding service helpful multilingual staff and our signature warm DoubleTree chocolate chip cookie. Our contemporary hotel near the Houston Galleria provides huge residential-style suites perfect for accommodating the entire family or for business travelers in need of extra space to work and relax. Some of our suites have balconies and all feature high-speed wireless internet access and full kitchens including a microwave dishwasher and refrigerator. Upgrade to an even more spacious and luxurious Executive Level suite giving access to the Executive Lounge which offers breakfast Monday-Friday evening appetizers Sunday-Thursday and complimentary access to a computer printer and fax machine. With over 9 500 sq. ft. of flexible column-free meeting and event space our Houston hotel near the Galleria Mall is the ideal venue for any business meeting convention or special event. Whether traveling for business or leisure all of our guests at our Houston hotel will enjoy the convenience of our 24-hour business center and fitness center outdoor pool and stylish on-site restaurant McKinley*s Bar - Grille. Unwind with your favorite drink after a long day of meetings or join family and friends for a full meal. We look forward to welcoming you to our Houston Galleria hotel soon. Order Room Service and enjoy delicious dishes in the comfort and privacy of your own room or suite. Enjoy savory entrees and dishes from our carefully crafted Room Service menu.